Gromko D, Abdurasulova G. 2019. 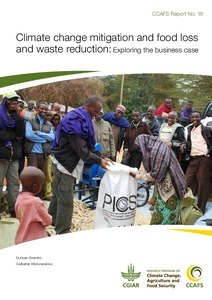 Climate change mitigation and food loss and waste reduction: Exploring the business case. CCAFS Report No. 18. Wageningen, the Netherlands: CGIAR Research Program on Climate Change, Agriculture and Food Security (CCAFS).